Shop Smart offer: Please do come and ask for free advice and guidance on purchasing, care, licencing and use of sporting guns, for all Shop Smart members. For the discerning sportsman, and trap shooter, we welcome you to visit us for all your shooting requirements. Stockists of the latest season of country clothing from Top Gun and David Nickerson. 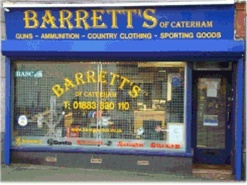 With an excellent range of shooting accessories. CCI suppliers for clays and cartridges. Suppliers to the individual, enthusiast, clubs, syndicates and the trade. We have a vast knowledge of selling to the industry. As members of the Gun Trade Association we can pass on discounts. Please feel free to look around our shop if you cannot find what you are looking for please e-mail us and we can locate the item and e-mail you back with a price. New shop at 10 High Street - The old Angling Shop.